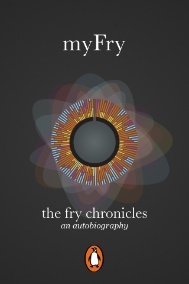 Bangkok Diary Tuesday 14 September 2010: Stephen Fry's autobiographical myFry - book review or app review? At one stage early this week I found there were four Macs in the house. Having got my self up and running again after a disaster, it was time to check the iPhone and download some apps. I am intrigued by the way that books and other content are being used on the iPhone and iPad, but most of the offerings stick to the rigid chapter and page format: the medium allows much more. Stephen Fry who is more of a Macoholic than I am, and a darn sight more talented too, has conspired with Dare, Stephanie Posec and Penguin, the paperback publisher, to come up with part two of his autobiography, The Fry Chronicles, that has been simultaneously released as a book, an audiobook, and an iPhone and iPad app: an app with a difference. Dare are the Digital Agency that Penguin has hired to good effect to put some oomph into its advertising and to develop iPhone and iPad apps. This is one of the fruits of that alliance. Stephanie Posec is the graphic artist who is responsible for the eye concept that Dare made interactive. Due to the oddness of the app and its obvious potential -- perhaps as a pathfinder -- I was keen to take a look at this, but was a mite disappointed to be charged the full $13.99 when it was shown as having a special launch price of $7.99. Small beer really ($6 is under 200 baht) but an offer is an offer. In a slightly confusing fashion, it appears in the apps list not as Fry, Stephen Fry, or even The Fry Chronicles, but as MyFry. In iTunes I dropped it into a folder with other book apps and synchronised. When the app is started, the central icon expands to fit the screen and looks like a round eye, with a black centre and coloured rods around the edge. As the finger is moved round, touching the rods, so these become larger, shrinking as the contact ceases. When each rod is at its largest, the central area has a section title. The rod at the top of the screen is number 1, "I really must stop saying sorry", and the last rod number 112, "Wicked and fun". Pressing one of these section titles in the center area or holding the rod end for a moment before releasing brings up a list of sub-titles each of which leads to another ring with a smaller selection of rods. These lead to the texts. When arriving at the printed word there are several choices accessed by back and forward arrows placed at the top of the screen. There is inevitably some overlap and one time I accessed a section titled Technology it had 6 examples, while in another I found 14. "Hugh enjoyed about a week of relaying the news of my fantastic expenditure on something as absurd and unworthy of outlay as a raincoat before he discovered that this Macintosh was a new type of computer." "For years and years after the January 1984 release of the Apple Macintosh the rivals . . . all dismissed the mouse the icon and the graphical desktop as gimicky, childish, and a passing fad." We remember fairly well how they embraced the technology they dismissed the moment they were able; and now they are doing it again with the iPhone and the iPad. Unlike the ebooks that use Apple's iBook app, the text here cannot be copied. Try as I might, none of the Cut and Paste controls was playing ball, so that limited what I could do with this review. Beneath the text are some controls: for making the font larger or smaller; a star to mark the passage as favourite; and a gear-wheel icon to return to the top "eye". With this construct, reading this in a linear fashion is not easy, so the reader is naturally encouraged to dip into a section rather than deal with the subject chronologically: to snack instead of gorging. None of the icons, tags or pages could be read when my iPhone was in landscape mode: the app only appears to allow upright (portrait) display. 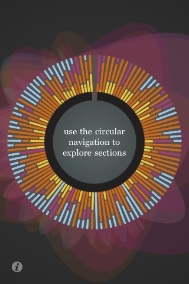 Even when trying to control the way we read with myFry, the app leads us around and around. "A meeting that would change my life," has several sections that include some well known names like Rowan Atkinson, Alexei Sayle, Richard Curtis, Rik Mayall, Ben Elton and Thatcher. Not Mrs, or Margaret, but the surname: a statement on its own. And the Thatcher tag leads to a number of texts in which the names overlap, suggesting that these names function in part as keywords rather than separately provided items. Fry's writing is so often anecdotal that the presentation format that the app provides benefits his way of expressing his ideas and although he has the luxury of space (especially on his own -- sometimes underused website), he fills the texts well, hardly wasting a syllable. And his sentences are well-crafted. Those who aspire to teach writing would do well to idle away a few hours absorbing Mr Fry's output: not a "moreover" to be seen. The controls include the familiar i, for Information and even here the value of the delivery mechanism is being milked, although not to its full potential. As well as the credits, there is a link to Mr Fry himself explaining in that familiar voice about the purpose of the app and the way it works, even managing to squeeze in a new word, "furcated" to explain how the concept works. For the record, furcate means, to divide into two or more branches; to fork. And I did have to look it up. Below the "Stephen explains" control button is another that reveals the script and, towards the end of this are credits and a number of links (Penguin, Dare, Stephanie Posec's ItsBeenreal, and to Fry's own site.) With all the dodging about I was doing, I did manage to crash the app once or twice, but whether this was due to the app or the low power of the iPhone 3G I use, is unanswered for the moment. I also found it a nuisance while reading to find the screensaver dimming the screen then (if I was not paying attention) turning it off. The iPhone settings section does show this app but all we may control are sounds, removing reads and removing favourites. The way most of us read has changed. While I would gladly spend hours or even days on my reading, happy to take the time digesting some great literature, the world has moved on and many of us deal in snippets of information: condensed or abridged for easy intake. The last two novels I bought (Pynchon and Eco) lay on my table unfinished because sadly so much more takes up my time, although I have managed to read some short books on the iPhone. Fry and those who follow will tap into this changing dynamic that the hand-held reader is creating precisely because they avoid the centuries-old format that the reader was designed to cater to. Instead they are looking to the newer dynamic of a multi-layered approach instead of the linear that the book, chapter and page have tied us to for centuries. I do not cite this as a good thing and I look forward to time when I can indulge myself in such pleasures: a great excuse when we age, of course. In the meantime, I will be quite content to peck away at myFry and its almost randomly placed contents.